If I had to choose one Christmas Craft to choose as my favorite this year.... this DIY Christmas Pom-Pom Garland is probably it. Seriously, folks. It's got all my favorite crafting elements. It's super easy to make. The materials are really affordable. And it's hyper colorful. I'm mean seriously.... is this not the cutest garland ever? 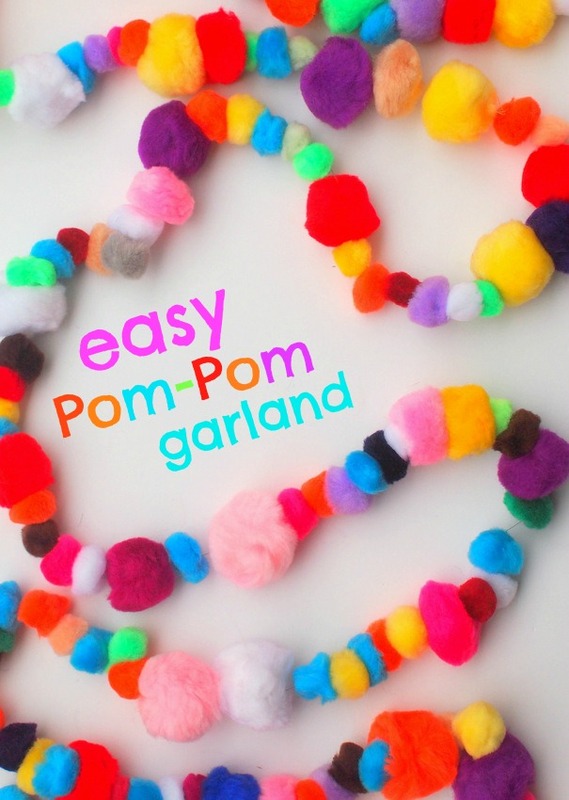 I've been ogling pom-pom garlands forever. I saw a cute one on Anthropologie's website awhile ago, but totally balked at the price. So when Oriental Trading company offered to send me some Christmas craft supplies in exchange for an honest review, I was stokked. After peeking through all their Christmas stuff I picked a couple of things and then fell in love with this 1 lb bag of Pom-Poms. What does one do with a humongous bag of pom-poms? We've already had several indoor pom-pom fights. And now I've made my very own pom-pom garland. I pulled out a needle and thread. Then, I tied a couple of knots in my thread and strung pom-pom after pom-pom onto it. It reminded me of stringing popcorn onto a string. Now my initial piece of thread was too short, so I ended up tying on another piece and kept going till I got the length that I wanted. Then, I double knotted my thread after the last pom-pom. It's amazing that after watching 1 tv show, I had my very own garland! I LOVE the results of this super easy craft. It adds such a fun pop of color! 1. Pom-poms are squishy. After I finished my garland I realized that my pom-poms slid around, revealing bits of thread. Now this wasn't too big of a deal because I could just shift pom-poms over. I'm not a perfectionist, so that didn't bother me to much. 2. Also, you have to be careful when you store or twist your garland. Because the thread is very thin, it can get easily tangled. Perhaps using thicker string like baker's twine could prevent that? Adding even more color to our home's crazy Christmas corner. As you can see, it's tchotchke central over here. By the way, if you like the ornaments on our tree, I share how we made them in the links below. Ok. That's all! Hope you have fun crafting this holiday season!